Published in the Dover Express, 22 February, 1980. Dover’s playhouse best known as the Hippodrome was at Nos 33 and 34, Snargate Street from the year 1790. It was founded by a local Company, the capital being subscribed in £50 shares. From its being patronised by Royalty at different times, it was called the Theatre Royal. 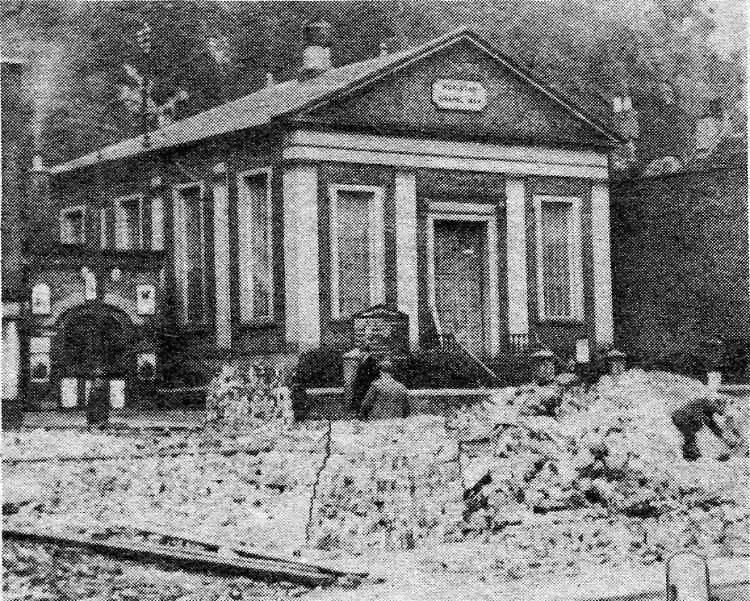 For a little while, in 1844, its use as a theatre was abandoned, and an advertisement appeared in the local papers, signed by John Boyton, stating that “the building recently used as a theatre may be hired by the day or the week for any public purposes.“ On the occasion of the opening of the South Eastern Railway, the inauguration banquet was given there. The re-occupation of the building as a theatre was soon after resumed, and a few years later the name was changed to “The Royal Clarence Theatre.“ In the year 1896 it was re-built, at a cost of £25,000, by a public Company. It was re-opened then as “The Tivoli Theatre,“ but, after a few years, resumed the name of “Theatre Royal." In 1909 another change made it “The Royal Hippodrome." On the same side of this part of the street, the Roman Catholic Church of Our Lady and St Martin was erected in the years 1905-06, and opened by the Bishop of Southwark on the 29th March, 1906. It was in Snargate Street, at No. 45, where the first Catholic Mission was opened in 1822. The 3rd of June, 1834, was a grand day in Snargate Street, when the foundation stone of the Wesleyan chapel was laid. The Wesleyans were then the pioneers of Evangelical Christianity. This was their third chapel in Dover, their first having been in the Pier, and their second at Buckland. The move to Snargate Street from the Pier was the most important step the Wesleyans had taken since their establishment in Dover, the dense and decorous crowd which assembled to witness the stone-laying being in striking contrast with the howling mob who surrounded Charles Wesley, when he preached in Biggin Street, seventy-four years earlier. On the site of the new chapel were assembled 300 Sunday school children. There were 1,000 other spectators admitted to the site by tickets, and hundreds more crowded the surrounding cliffs, windows and housetops. Three hymns, composed specially for the occasion, were sung, accompanied (the report says) by instrumental music, which was not then a common thing with the Wesleyans. In the foundation stone was placed an iron box, containing coins of the reigns of George III, George IV, and of his then reigning Majesty, William IV; also a copper plate engraved with John Wesley’s motto, "The best of all is, God is with us," together with a parchment, inscribed with the date of the stone-laying and the name of Mr White, who had been more than fifty years a member of the Dover Wesleyan Society, who laid the stone. The benediction was pronounced by the Rev J. Roberts, late missionary at Ceylon; after which the whole company sang “God Save the King.“ The chapel was opened for worship on the 3rd October, in the same year. At the centenary celebrations, the mallet used at the foundation stone laying was one of the treasured exhibits. When the chapel in Queen Elizabeth Square was closed in 1834, the pulpit in which John Wesley had preached was re-erected in the Snargate Street edifice, and from this, in 1934, the centenary sermons were preached. In the days of horses and carts . 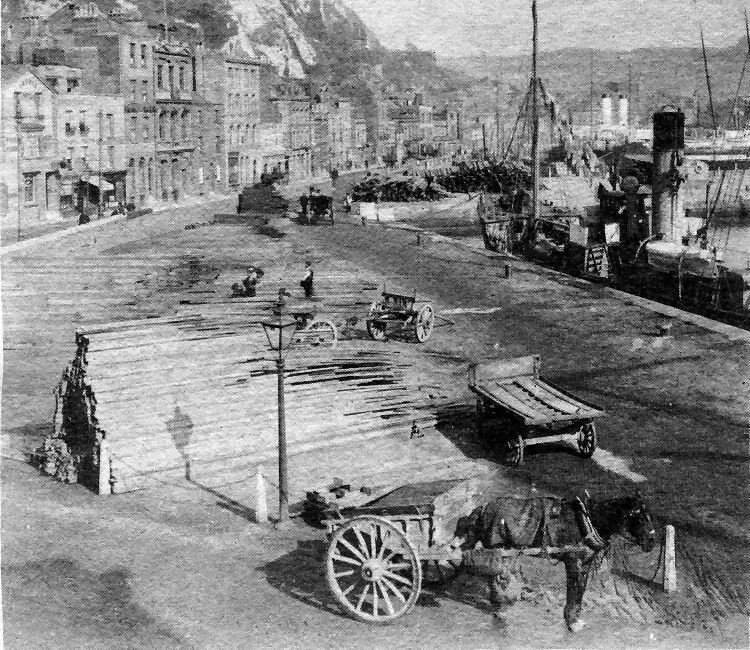 . . the scene at Commercial Quay around the turn of the century. At the extreme left of the buildings is the George Hotel which stood at the corner opposite the Packet Yard. Next is Whitford’s tobacconists, the Mechanics Arms and the Friendly Societies’ convalescent home. A lower building with a white front and cart outside is the Barley Mow Inn and nearby are Union Hotel, Golden Anchor Hotel, New Commercial Quay, Standard and Old Commercial Quay public houses. Another interesting property nearby is the Pentside Baptist Chapel. All these properties were demolished in 1928 by Dover Harbour Board to increase quayside facilities. The ballast carts in the foreground were used extensively for the transport of earth in connection with the construction of harbour embankments and -quays as far back as the time of Henry VIII. At the quayside is a French fishery protection vessel. It was at this Granville Dock quay that the old sailing ships discharged cargoes of sawn timber. The Wesleyan Chapel, which had a hall in the basement, in Snargate Street, near the foot of the Grand Shaft spiral staircase to the barracks on the cliff-top. The chapel bears a plaque dated 1854. The picture was taken during the final stages of clearing the Commercial Quay properties which faced the Granville Dock. 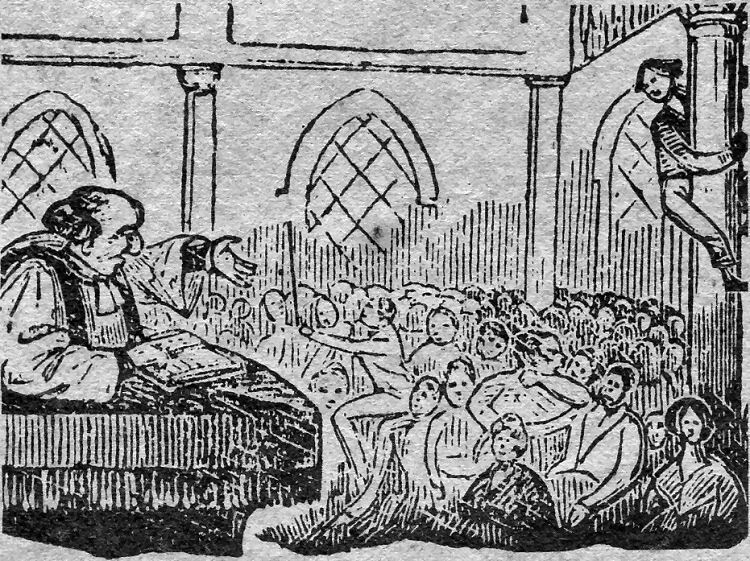 The above picture, is an original wood block engraving of about 1800 depicting Charles Wesley addressing a lively audience.